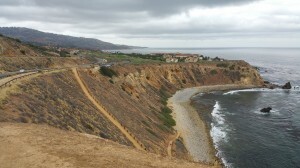 My wife and I took an anniversary break out on the Palos Verdes peninsula last week. Is it just me or do the sleek young people who greet you at a fine hotel make you feel something like the newest citizen in Emerald City? I’ve never really felt worthy of these places. I love them, but there’s an old money effervescence of Moroccan leather and expensive cologne everywhere — the effortlessness of casual good breeding. You are almost certain the beautiful brunette checking you in is on spring break from Vassar. The sweaty old man charging through the lobby with a tennis racket might be the twenty-first Earl of Suffolk. Okay, that’s overdoing it, but I was raised to be suspicious of the world. So were you. We all were given a world of absolutes by our clan. In so many spoken and unspoken ways, we are told who might be evil and who to trust. You might, for example, be an NPR family and you are damn certain the people who produce the Rush Limbaugh show hang kittens in the green room for target practice. As a little girl, you might have helped your grandmother cultivate pot in her basement, and, somehow, when a really clean cut frat boy asks you out for dinner, your attraction to him feels like some sort of tribal crime. As a first grader, visiting the Museum of Natural History, I was attracted to a tour guide. She had an English accent, and she was treating all of us children like infant-savants. I found her respect for us, as kids, and her attention, both exhilarating and troubling. She wasn’t a member of my own religious, conservative tribe — and yet she was so kind, so alive, so anxious to share the wonder of the world with us. What’s going on here? This is good, right, but it must be bad too. All of the good, bright, truthful people are supposed to have our tribal markings, right? During one of our morning walks in Palos Verdes, we saw a falconer, (an owler?) sitting out in front of the New Age-y gift store, talking to kids and their parents about the great bird of prey that was resting on his arm. Cartoons have done owls a great disservice, because when you get close to one, there is nothing playful or timid about them. They have raptor-like intensity, and even their their serenity feels vaguely dangerous. I didn’t trust, moreover, the whole setup. 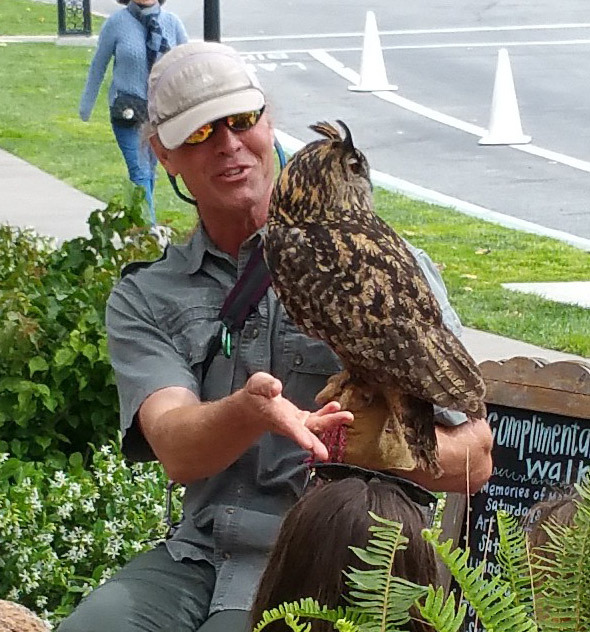 The guy had khaki safari clothing on, and I could almost guess this owl was being used as pretext for shaming our very humanity. I like plastic bags and long showers and I was almost certain the words “global warming” would be deployed, liberally, in his owl-speak. I went into the gift store and purchased a “fly’s eye” kaleidoscope for my granddaughter. “What did he say?” I asked Mary, later. I didn’t know that, and I found it genuinely interesting; I chuckled at my prejudice. Mary and I went off to the room and simmered in the porch sun, telling stories and laughing over Mimosas. The world was an opulent place, filled with jeweled truth and exotic owl feathers. Of course, it’s also an evil place too and the Mimosa can only stave it off for so long. We have inherited an existence that allows us to marvel at something as gorgeous as an owl, and still recoil, a bit, at the prospect of the creature ripping the entrails out of a twitching ground squirrel, and gulping them down like cotton candy. We weep when we see a small black child handing a water bottle to a white policeman in the middle of a race riot, and we cringe at an ISIS thug shooting a veiled woman in the head — for the “crime” of wearing too bright a parka. Along this road, inevitably we place trust in our political or spiritual tribe. We are creatures desperately in need of labels. Ben Affleck admitted, recently, he has trouble watching even great films if a conservative Republican is behind them, and when Bill Maher made some dismissive judgments about Islam, Ben looked like a little boy about to cry. Couldn’t Ben at least count on Bill Maher to ridicule Christians and hold up Muslims as third world victims? Christ knew about this tribalism of Ben Affleck and Jim Riley. Christ went out of His way, in scripture, to be seen praising those without conventional approval. He arrived on earth in a stable, not in a palace. He praised a Samaritan, who had a different scripture and a different temple than the Jews of the day. When a Roman centurion declared Jesus as having “authority,” as a ruler who merely needed to speak the words to affect a healing, Jesus marveled at the man’s faith. Jesus praised a harlot, who was more generous and caring than His own disciples, when she adorned His feet. Jesus had no use for anyone who held up their birthright, their “chosen” status, calling the Jewish religious leaders of the day, “sons of the their father,” the devil. Finally, on the cross, in what might seem to superficial students of scripture a contradiction of all conventional morality, He pardons a penitent thief and promises him eternal paradise. For the record, I happen to enjoy my adopted tribe — those reformed folk, the Presbyterians and the Congregationalists, those fighting, drinking, Christ-loving warriors of the American Revolution. As labels go, I like that one, and I would prefer my owls to be orthodox in their doctrine, but we need to remember that truth is surprising. It is found in odd places. You might have a healthy disrespect for contemporary American academics, and you would be justified, but every now and then, one of them will tell the truth. You might hate everything that Mohammed, that butcher, ever taught, but there might be a few Muslims more generous, and maybe even more inquisitive than you. You might think, with your green car, you are saving the planet, and then you visit a farm full of home schoolers who seem to be more “local” in their produce and “recycled” in their clothing than you are. Ben Affleck might even learn something from Clint Eastwood, and that really would be a miracle.